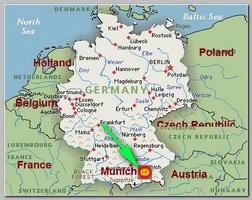 Police in Munich, on New Year’s Eve celebration on Thursday 12/31/2015 night, evacuated two major railway stations after an intelligence agency warned Germany of an imminent attack, officials said. Cities across Europe have been on alert for a possible New Year’s Eve attack. Between five and seven militants, believed to be from Iraq or Syria, were thought to be planning an attack, Munich’s police head Hubertus Andra said. Local media reports say the information had come from French authorities.